It's been a whole season since i've updated my What's in my bag? but with the leaves falling, the city getting colder and the AW15 trends in full flow it was only time. This season I have updated my go to handbag to a black River Island tote (SHOP) which is perfect for everyday use and has all the space I could dream of. It is always too tempting to go for a vibrant coloured bag however not always that practical. Both the colour and structure paired with a gold polish lining are chic and sophisticated. You may have noticed once again that my handbag is filled with Lulu Guinness, after all she is my favourite accessories designer. Since my last, 'What's in my bag? ', I have added my lilac lip clasp purse (SHOP/similar) which I received as a graduation present and also a Lulu shopper for my birthday (SHOP). This shopper is one of a kind and its foldable design allows you to pack it into a compact pouch in the form of Lulu's trademark lips . Of course I wouldn't be able to part my Lulu Guinness make up pouch (SHOP/similar)- could we expect this wonderful lady to create anything besides handbag perfection? For AW15 I have condensed my carry around cosmetic selection. Along with my Chanel compact mirror I always carry two lipsticks- one for everyday and one just incase things get a little sassy. Currently I am using Chanel Rouge Coco in Edith (SHOP) and MAC limited edition Private Party. The two couldn't be more different, yet perfect for day and night. I have also changed my Victoria's Secret scent to Pink Fresh and Clean and have received many compliments on its divine smell- I literally go through bottles of these Pink minis! Another of my essential make up items to is my current nail polish as chipped nail polish is less than desirable so its is necessary to have a quick fix. This week i'm wearing BarryM Gelly in plum (SHOP). Of course what would my handbag be without a few essentials? My Kate Spade planner, a copy of the latest Vogue (or Elle) and a pair of sunglasses make my bag complete. 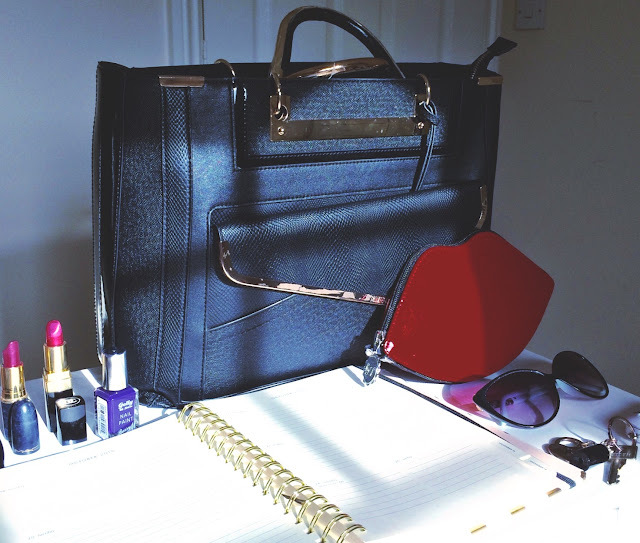 What's in your bag for AW15 darlings?